Hey guys! Thanks for checking out my little online clothing shop 🙂 Haha. The girls are growing so quickly and I have so many cute things, in three’s, that I want to sell. Below is a gallery of a few of those items. Please email me at sbhosu@gmail.com if you are interested! I have listed a description of the item and the price!!! 1. 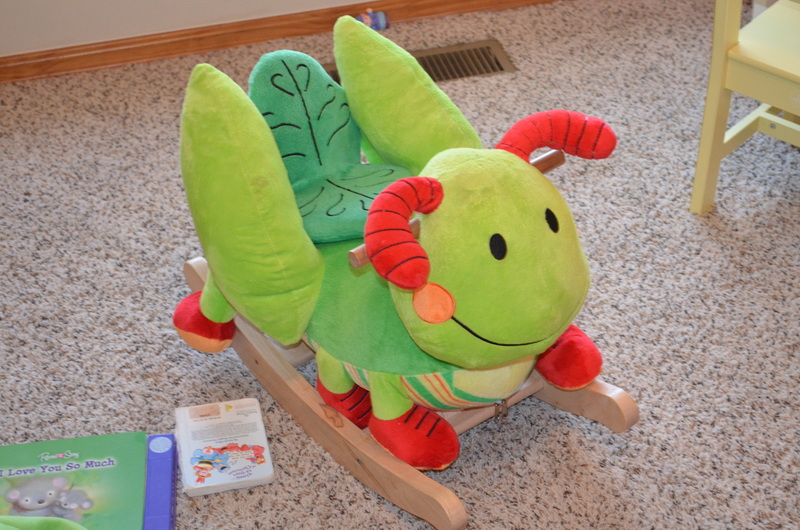 Bug Rockers – $45 each (I will take $35 for the ones that do not play music anymore) – These rockers are a favorite in our house! The girls love them. 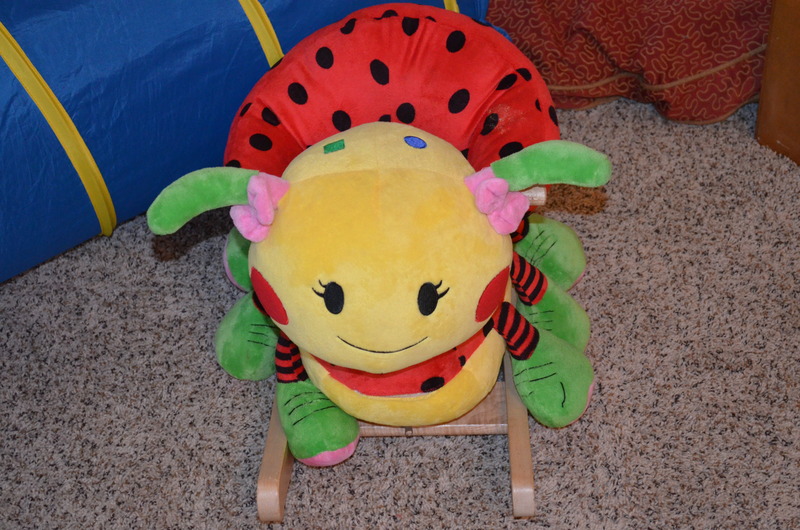 I have a grasshopper, a ladybug and a bumble bee. 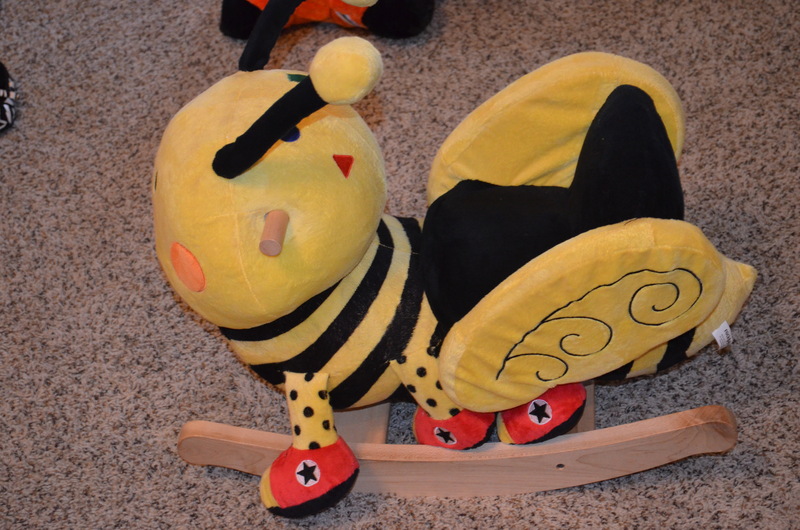 Unfortunately, the bumble bee is the only one that still plays music (They each have a battery pack, but the ladybug for sure is ca-put), but the others still rock, rock, rock. 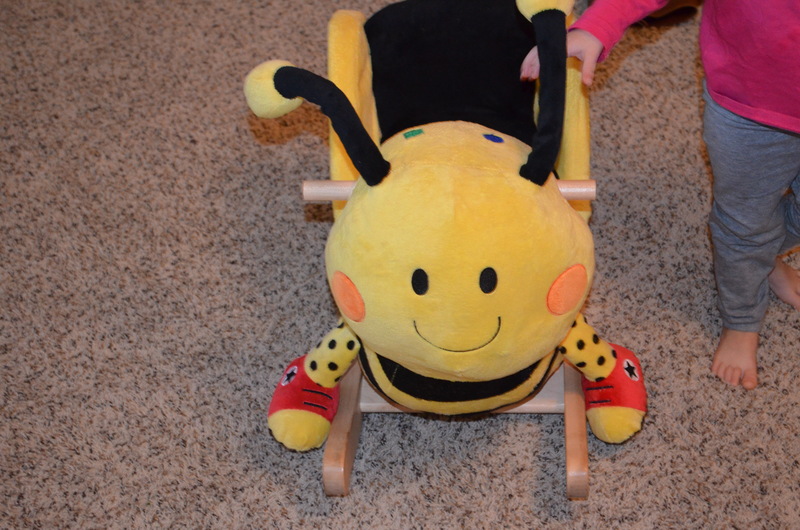 May be a great Christmas gift for a little one! 3. 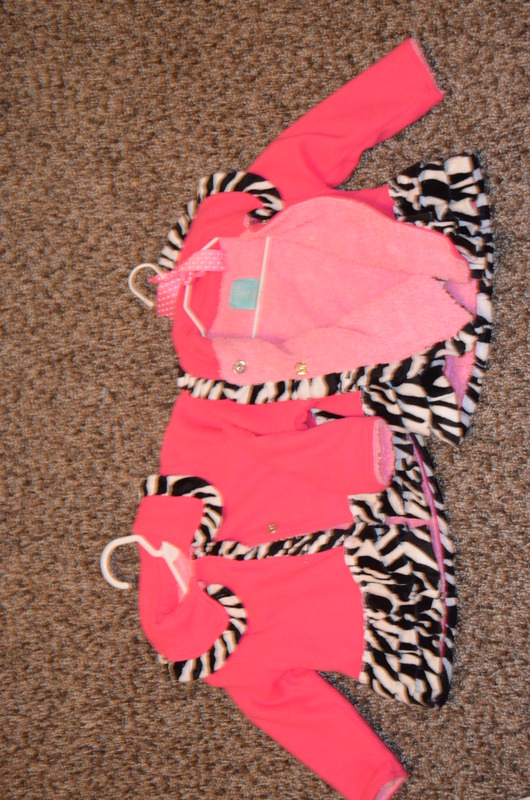 Brand new, never worn, Mudpie hot pink and zebra ruffled jacket (2 available) – Asking $30. Again, this is another heartbreaker for me. LOVE THIS JACKET. Again, 12-18 months. Just precious. Lined with a cozy fabric on the inside. Snaps in the front. This program is giving me fits and will not flip this picture. If you want a better one I will be happy to email it to you. Right side up! 4. 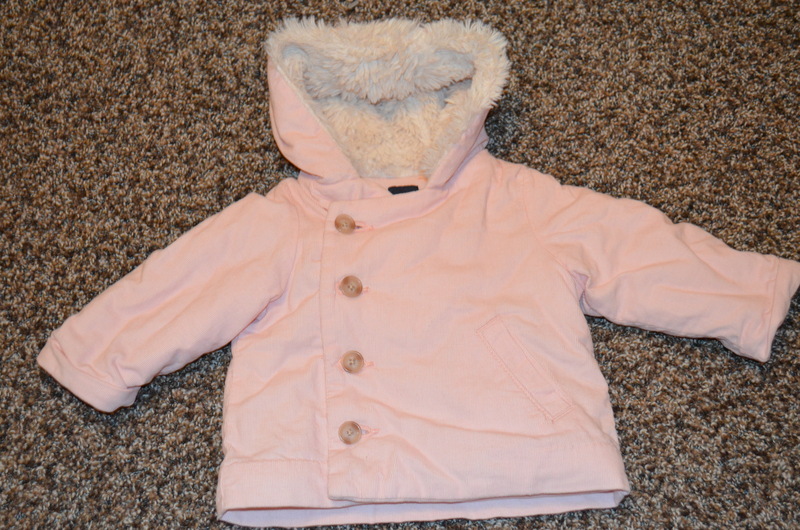 Baby Gap, pink downed coat with fur-lined hood. – $20. Size 6-12 months. Two available. I think my girls wore this twice! 5. 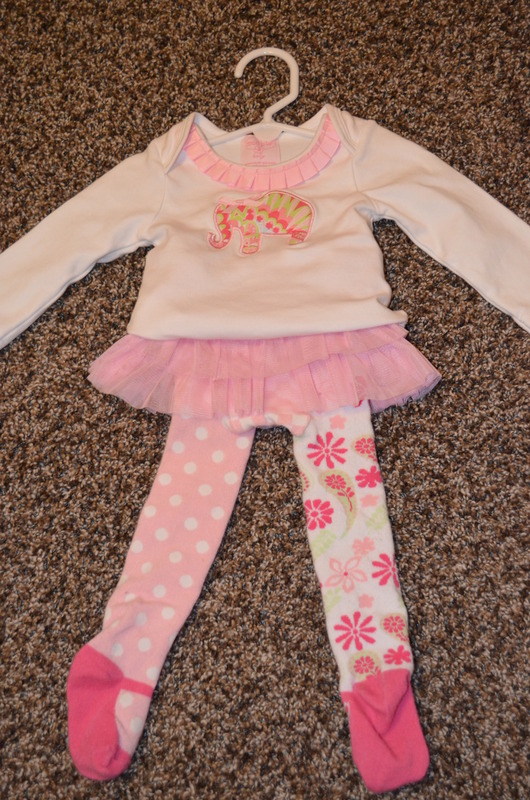 Mudpie elephant top with matching tutu skirt with attached leggings – $10. Two available. Size 12-18 months. Remember I said these run a little small. 6. 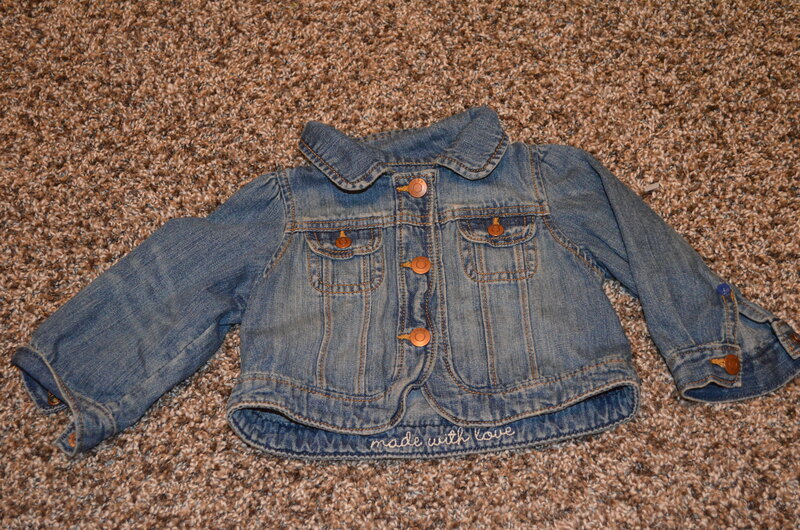 Baby Gap jean jacket. Two available. $10. Size 6-12 months. Perfect for spring and those in between seasons! 7. Ruffle Butts bloomers – infant size. 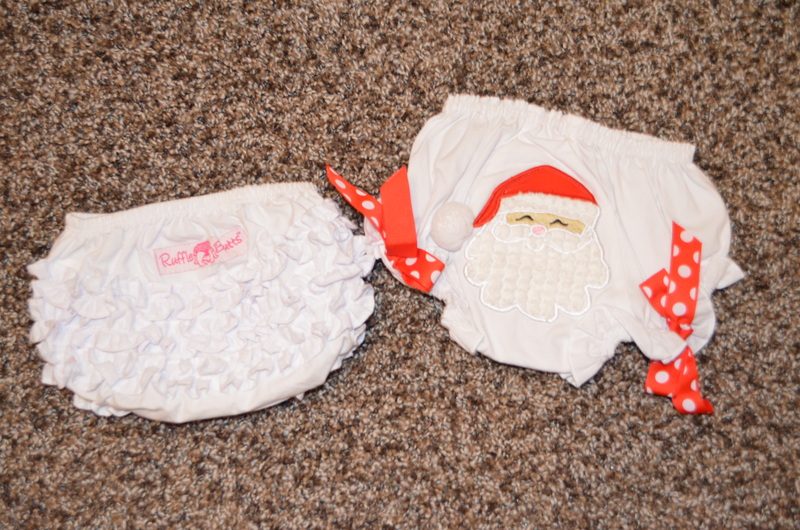 Mudpie Santa bloomers – 6-12 months. $5 each. Only one of each available. 8. 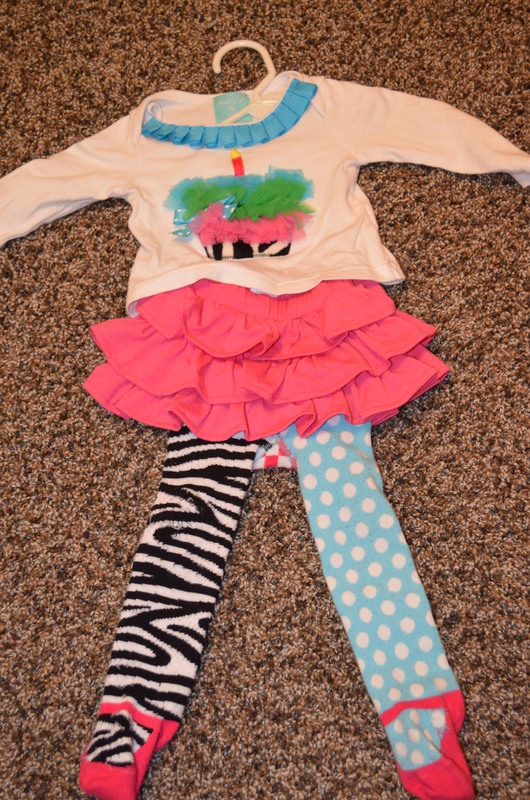 Mudpie birthday cake outfit. One available. Size 6-12 months. 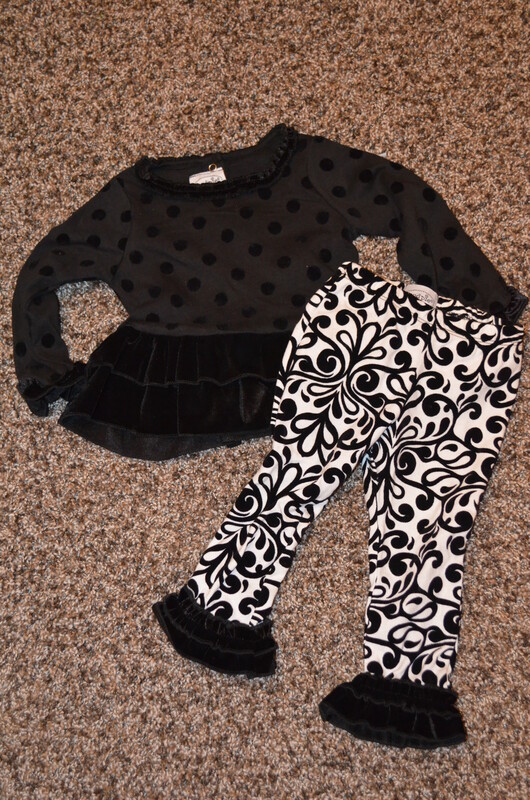 Top with matching skirt with attached leggings. $10. We wore this for our first birthday! 9. 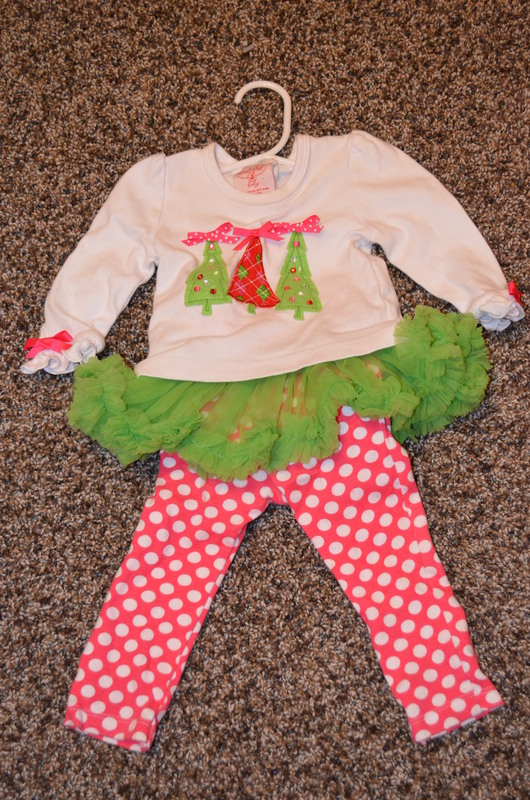 Mudpie Christmas outfit. Tree top with matching green tutu skirt and attached leggings. Size 6-12 months. $10. One available. My girls had their pictures taken with Santa in this last year. 10. 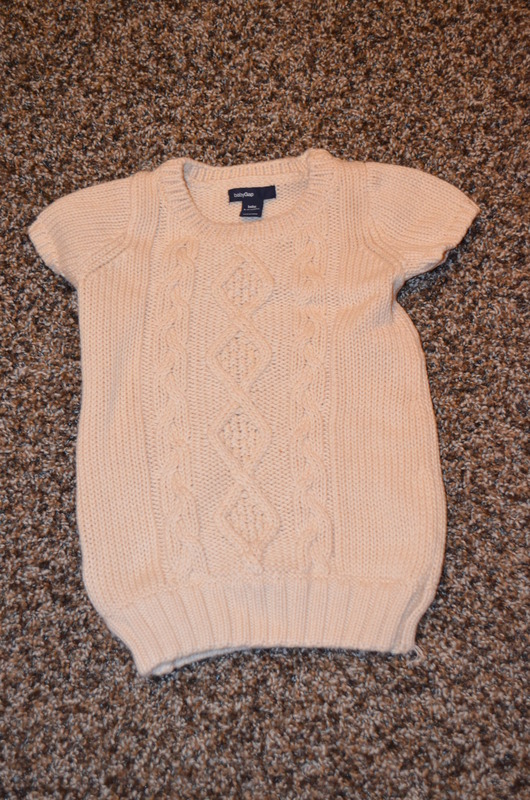 Baby Gap sweater dress. Size 6-12 months. Two available. $10. I love this dress. My girls looked so cute in this with fun tights and little Ugg style boots. And its not itchy! I am going to do my best to recreate this blog post. I was ready to publish it and it completely did not save anything! I hate that!!!! Above are my three precious little gouls..Haha. 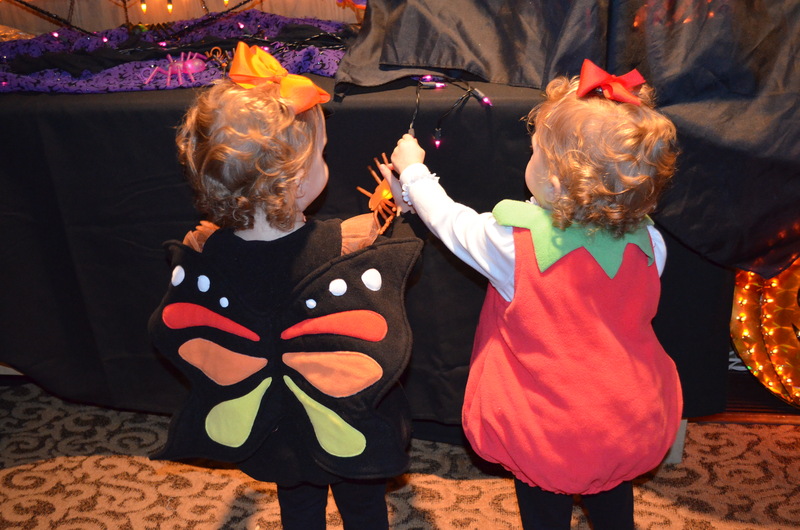 Our official first time to trick or treat and they did really well. They had a good time changing out costumes this week. We had a few events to attend so they all got to swap! 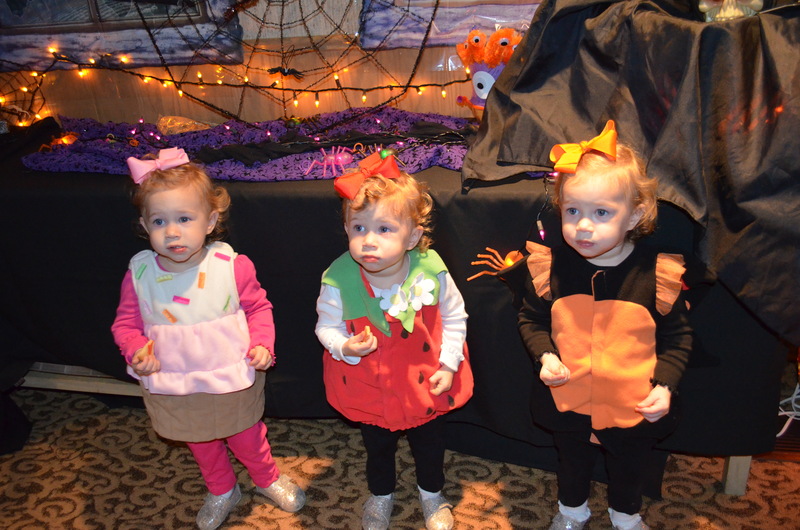 This pic shows Camdyn as the cupcake, Emily as the strawberry and Avery as the butterfly. 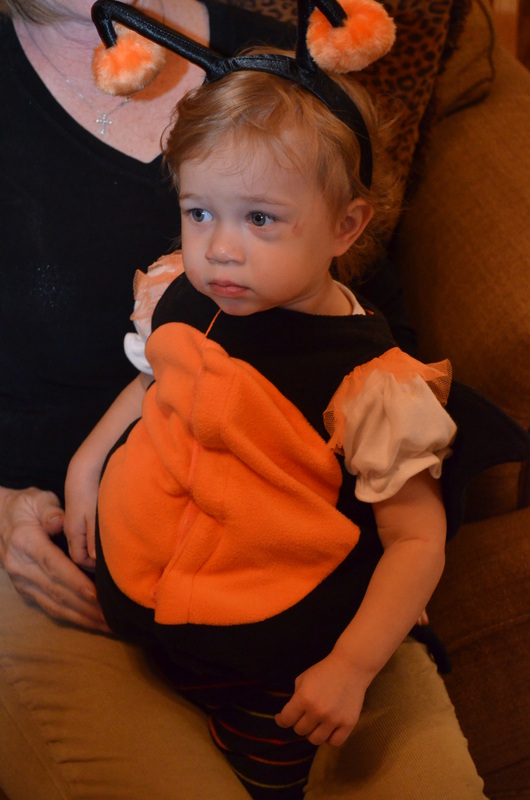 Avery is my little social butterfly for sure. She is darn independent too! She got the hang of going up to people’s doors and putting out her cute little bag. She put the bag right back up on her arm like a little purse and took those little twinkle toes down the sidewalk. She wants to be independent and a mama’s girl at the same time. I am totally okay with both right now. The girls are talking up a storm. It makes me smile when they discover a new word. They are growing into such little people. Almost 21 months old! Love this sweet little pic of Avery. 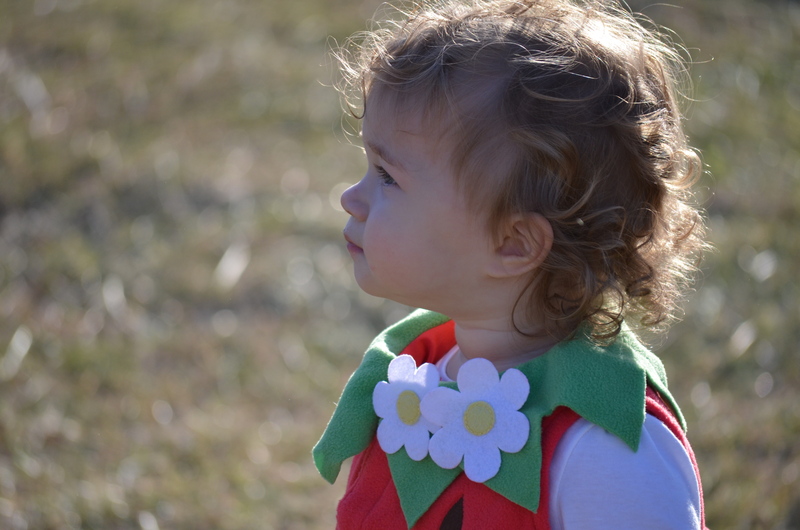 This was one of our adventures in our costume to a local pumpkin patch. They loved running in the open field there. Sisterly love with Avery and Emmie. Ahhhhhh. Camdyn is such a funny girl. She laughs and has such a cute smile. She is genuinely a pretty happy girl. Which is darling that one of her favorite words right now is “HAPPY.” She also says “Elmo” and many other things but the other day I heard her say her sister’s name “Emmie.” Melted me. 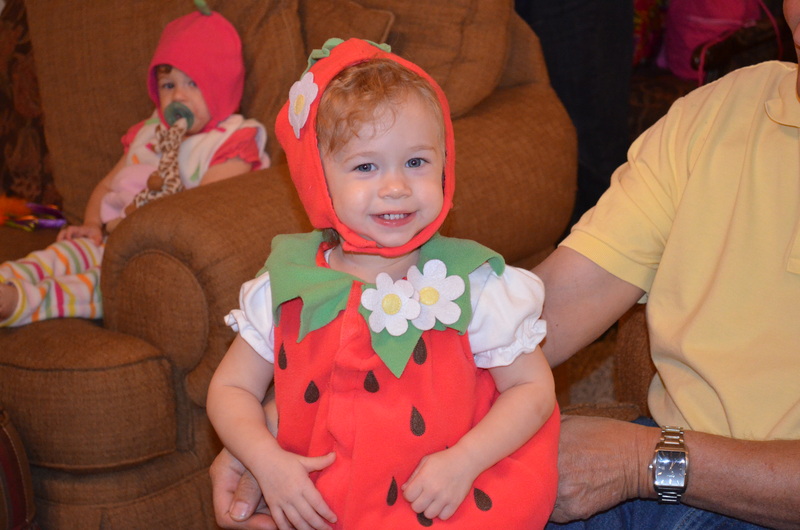 She got to be the strawberry tonight for Halloween. She was not much for going up to the door, but liked to ride in stroller and enjoy the adventure. 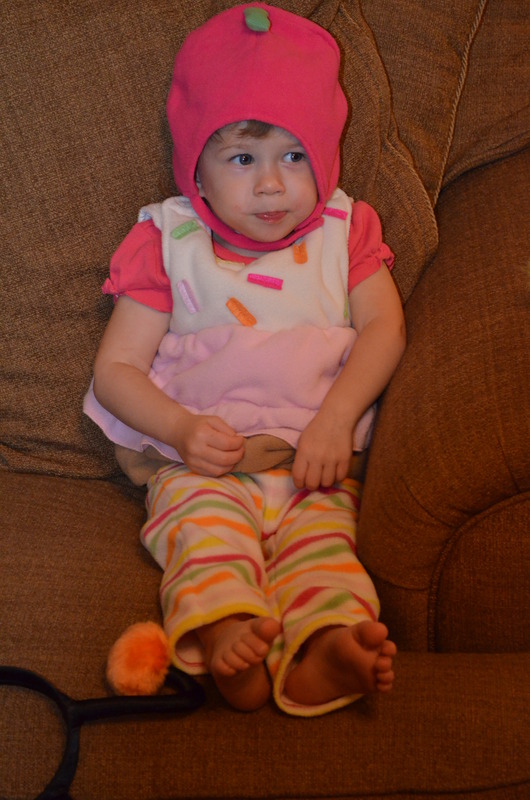 Here is serious Emily as the cupcake. She really does not have a lot of fear. She is really technical during the day with her books and toys, but she is adventurous and does not let anything slow her little self down. Always have loved that about her! Emmie doesn’t say much but probably because she is content with a pacifier in her mouth like Maggie Simpson. Think I need to change that soon. And finally, here is Miss A as the butterfly again. We are so fortunate that they are so incredibly loved and adored by family. Both sets of grandparents and their Uncle Michael and Aunt Amanda and cousin Reagan came along for the walk around too! And like I said in the title, they may dish out a lot of tricks during the day, but they are always my sweet little treats. Happy Halloween from the Coys!